Drop Scale has an "official" capacity range from 0.1 oz (1 g) to 13 lbs (6 kg), but it's actually slightly more precise than that. The scale always measures in decigrams (or increments of 0.02 oz), but decigrams aren't always displayed in the app. There are many factors involved in this decision, but it really comes down to striking the best balance between precision and stability. 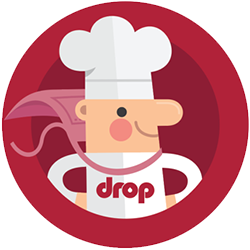 To do this, the Drop Recipes app includes measurements to the decigram (or 0.005 ounces) within a recipe, but in "scale only" mode, it displays measurements to the nearest gram (or 0.1 ounces). Why didn't you make it more precise? Most digital kitchen scales are in this range, and before we started manufacturing, we carefully considered our options. The problem with making a connected scale like this more precise is that the cost to produce it would increase drastically, making it more expensive to the end-user.